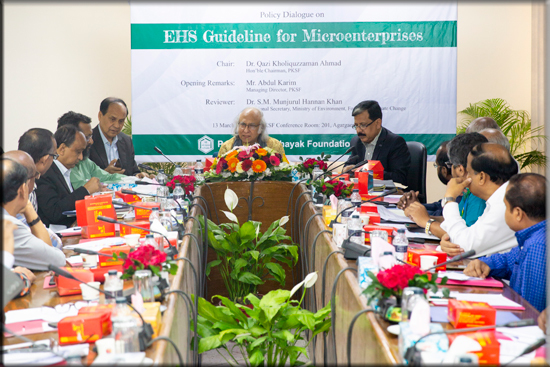 A policy dialogue on updated Environmental Health and Safety (EHS) risk for Microenterprise was held on 13 March 2019 at 10:30 am at PKSF. Dr. Qazi Kholiquzzaman Ahmad, Chairman of PKSF’s governing body presided over the event. Managing Director of PKSF Mr. Md. Abdul Karim was present on the occasion. Additional Secretary of Environment, Forest and Climate Change Ministry Dr. S. M. Munjurul Hannan Khan attended the policy dialogue as the reviewer of the EHS guideline. Deputy Managing Director Mr. Fazlul Kader and other senior officials of PKSF participated in the dialogue. Apart from a number partner organizations, representatives from different government and private sector organizations including a number of microentrepreneurs also attended the event and take part in the discussion. Managing Director of PKSF Mr. Md. Abdul Karim in his opening speech, mentioned the background of updating the PKSF’s EHS guideline for microenterprises. He mentioned that this guideline is very important at this moment as PKSF is expanding its Microenterprise Program rapidly. Currently, PKSF is providing financial services to around 1.4 million microentrepreneurs with a loan outstanding of 9300 crore. PKSF is implementing special projects to promote microenterprise sector under which various services and technical support are being given to microenterprises. PKSF is committed to promote this sector in an environmentally sustainable manner. The policy dialogue was organized to discuss PKSF’s ‘EHS guideline for Microenterprises’ which was recently updated under the IFAD supported PACE project. Mr. Maksudul Amin, Consultant gave a presentation on the updated guideline. The guideline covered EHS issues relating to various microenterprise activities under four major economic sectors: farming, processing, service and trade and suggested necessary measures to minimize environmental health and safety risks in these activities. The related regulations of different economic activities have been included in the guideline. Reviewing the updated guideline, Dr. S. M. Munjurul Hannan Khan suggested incorporating some areas regarding public awareness in the document. In general, he praised the guideline as a very useful document for managing microenterprises in an environment friendly manner. He also stressed the need for translating it in Bangla with adequate pictorial illustration to make it more user friendly. The participants gave their suggestions to improve the guideline from their own point of views. In his concluding remarks, Dr. Qazi Kholiquzzaman Ahmad mentioned that PKSF is committed to take necessary measures for promoting microenterprise sector in an environment friendly sustainable manner. He assured that all suggestions given by the participants will be incorporated in the guideline. Like other activities of PKSF, progress of implementation of this guideline will also be monitored. For excellent accomplishment, concerned people will be rewarded. Dr. Qazi Kholiquzzaman Ahmad thanked all for their active participation and valuable suggestions.